Comments - Interesting triptych featuring two kabuki scenes. 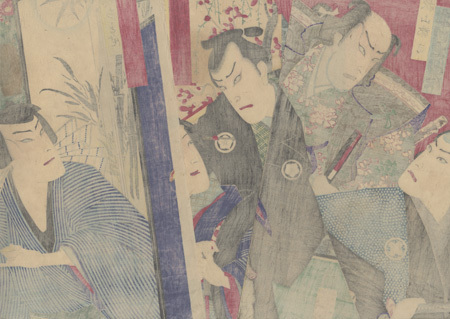 At left, a samurai in a dotted kamishimo looks up calmly at the disheveled warrior behind him, who grimaces strangely, loose hair straggling around his face. 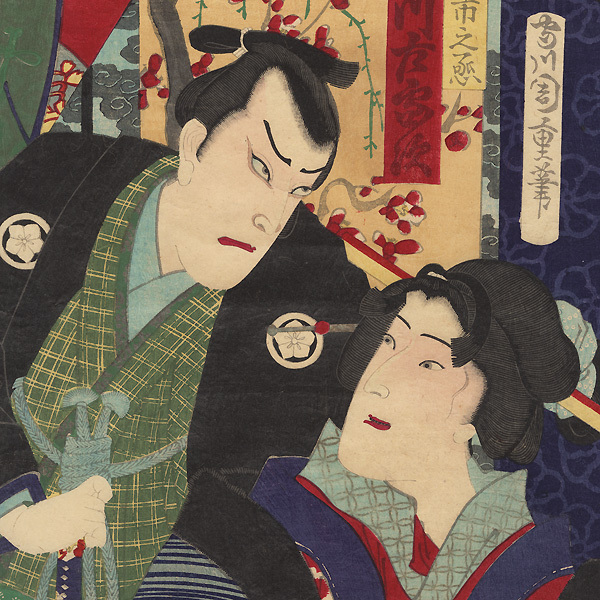 At right, a beauty smiles as she looks up at her companion, but samurai frowns back at her angrily. Behind a folding screen decorated with a full moon over a bamboo grove, a seated man looks up with a scowl as he eavesdrops on the couple, a cup of sake in hand. Beautifully detailed with burnishing on the black coat in the center and the black kimono collars. A handsome, colorful design. Condition - This print with excellent color and detail as shown. Three separate panels. Slight toning and creasing, a few spots in margins. Please see photos for details. Good overall.